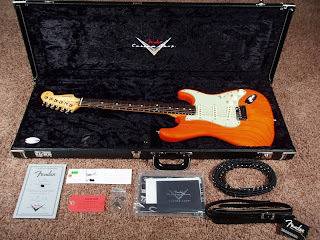 With a slight nod to early 60's features, this Strat is mostly a contempo config with its 2 point trem, 22-6105 frets and locking tuners. The '65 "C" profile sports a 9.5'" radius, finish is nitro and the white plastic is aged-- including a mint 3 ply guard. Pickups are 69's at neck and mid with a Texas Special bridge coil. So, it's a real mix. 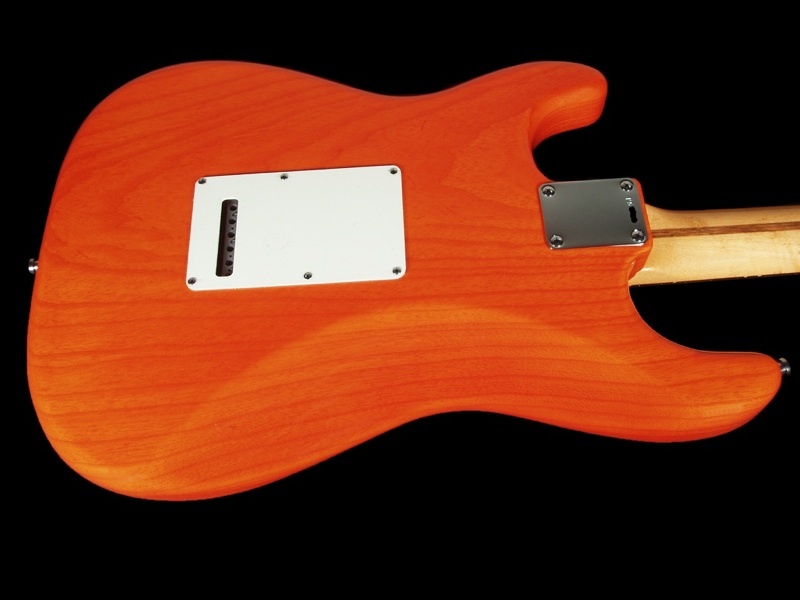 I'm just diggin' this sunset orange tint trans finish. Wonder what it's gonna look like in 10-20 years. Texas based G-Brats-Guitars currently lists this one. These guys have a few hi-end guitars on eBay. Top-rated 100% with lots of feedback (nearly 3K).